Copper Nickel Pipe Flanges, Cupro Nickel 70/30 Slip on Flanges, Copper Nickel 90/10 DIN Blind Flanges, Copper Nickel Alloy UNS C71500 Plates Flanges Manufacturer in India. 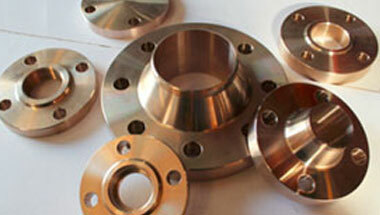 We are amongst the highly trustworthy manufacturer & exporter of the best quality array of Copper Nickel Flange. We produce Copper Nickel Cu-Ni 70/30 (C71500) Flanges, Copper Nickel Cu-Ni 90/10 (C70600) Flanges, Cupro Nickel Flange. The offered copper nickel flange is examined on quality provisions for make certain its flawlessness. These Copper Nickel Flanges are commonly used in application like Salt water pipes and fittings, hot water tanks, salt water baffles, propeller sleeves, valve and pump components, flanges, boat hulls, marine fittings and marine hardware, Heat exchanger and cooling plant, evaporator tubes, pump and valve trim, brake lines, condenser plates, pressure vessels and distiller tubes. Copper Nickel Flanges, Cupro Nickel 70/30 Orifice Flanges, Cu-Ni 90/10 Forged Flanges, Copper UNS C70600 Socket weld Flanges, Cupro ANSI/ASME B16.5 Reducing Flanges Supplier in India. Standards ASTM / ASME SB 61 / 62 / 151 / 152. United States, Ethiopa, Algeria, Mozambique, Chine, Germany, Malaysia, Morocco, Uganda, Colombia, Tunisia, Angola, Egypt, Italy, Cameroon, Israel, Dubai, UK, Saudi Arabia, Venezuela, Vietnam, Ghana, Azerbaijan, Peru, Canada, Bahrain, Iran, Mexico, UAE, South Africa, Kuwait, Sri Lanka, Indonesia, New Zealand, Kazakhstan, Trinidad and Tobago, Iraq, London, Thailand (Bangkok), Democratic Republic of the Congo, Australia, Nigeria, Jordan, Houston, Sudan, Russia, Argentina, Africa, Turkey, Brazil. Cape Town, Sharm el-Sheikh, Brazzaville, Subra al-Haymah, Benin, Bamako, Accra, Cairo, Kano, Abidjan, Colombo, Tel Aviv, Dakar, Tehran, Fez, Lusaka, Zaria, Giza, Riyadh, Mbuji-Mayi, Dubai, Luanda, Freetown, Mogadishu, Durban, Nairobi, Istanbul, Jerusalem, Algiers, Dar es Salaam, Port Harcourt, New York, Bethlehem, Lagos, Tripoli, Lubumbashi, Kinshasa, Douala, Port Elizabeth, Aqaba, Pretoria, Hong Kong, Soweto, Casablanca, Kampala, Doha, Johannesburg, Ouagadougou, Rabat, Maputo, Alexandria, Byblos, Ibadan, Dammam, Beirut, Data from the UN, Antananarivo, Omdurman, Addis Ababa, Mecca, Maiduguri, Amman, Harare, Abu Dhabi, Jeddah, Singapore, Khartoum, Yaoundé, Cairo, Kaduna, Muscat, Bulawayo, Conakry, Manama, Kolwezi.